An empty sausage truck was stolen sometime Wednesday morning from a family-owned sausage producer in Sunnyvale, and found later in San Jose with one suspect in custody and one still at large, the company's vice president said. Vice President and COO Pascuale Bitonti from the New York Style Sausage Company, located at 1228 Reamwood Ave. in Sunnyvale, told NBC Bay Area that his night manager saw someone drive the truck off the lot in Sunnyvale through a fence early Wednesday morning. Officers from the Sunnyvale Department of Public Safety followed the truck and lost it in San Jose, Bitonti said. Officers confirmed the arrest and the ongoing search for the second suspect. The truck was later spotted tucked in a campus operated by TMG Properties on West Tasman a short time later, Bitonti said. The driver had knocked over several light poles, the owner said. 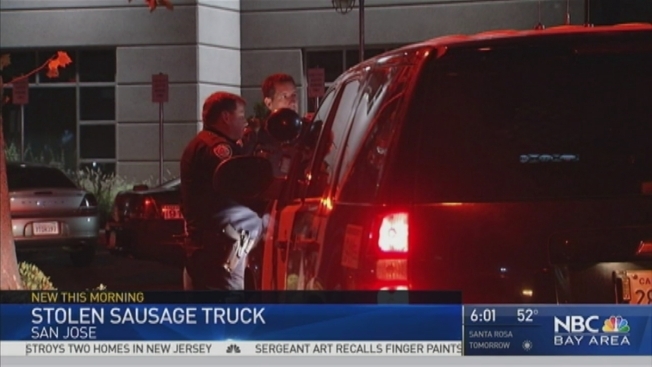 Police and dogs were looking for the sausage truck thieves in a nearby creek. Bitonti said that one of the suspects was caught and was was still at large just before 7 a.m.
Bitonti said his company has had no issues for about 35 years, but this is the second truck to be stolen in the recent past. During the earlier heist, the sausage truck was full; when it was recovered, half the meat was gone, Bitonti said. Editor's note:A previous version of this story said the truck ended up on the Cisco Campus, as reported by authorities. The campus is now longer owned by Cisco.